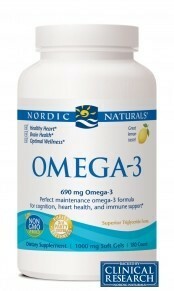 Nordic Naturals Omega-3 offers 690 mg of omega-3 per serving, far surpassing the expert-recommended dose of 500 mg per day. 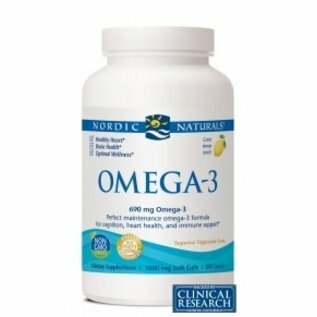 Adequate omega-3 intake is essential to support good nutrition and overall well-being, including healthy heart and brain function, as well as mood, cognition, and immunity. Wild caught. Pure. No fishy aftertaste. Every batch of Nordic Naturals algae oils is tested by a third-party certified lab for environmental toxins, including heavy metals. All algae oils are in the triglyceride form and surpass the strictest international standards for purity and freshness.. Suggested Use: Two soft gels daily, with food, or as directed by your health care professional or pharmacist.Free Of GMO, gluten, milk derivatives, or artificial colors or flavors. 1130 Mission St, Santa Cruz, CA 95060 "Trustworthy & Personal since 1982" Your Primary Health Fix. Effective and unique products, low prices, personalized and knowledgeable service.